Kunduz Afghanistan | Darth Frank, "The Tank"
Matthieu Aikins at New York Times Magazine has some potentially incriminating details on the October shelling of the Kunduz DWB hospital by an American gunship, which prompted military discipline (though no criminal charges) amidst a highly-redacted review of the incident last month, a horrific miscommunication in a war long “ended” that the U.S. media seem intent on bumping for a story on Donald Trump. 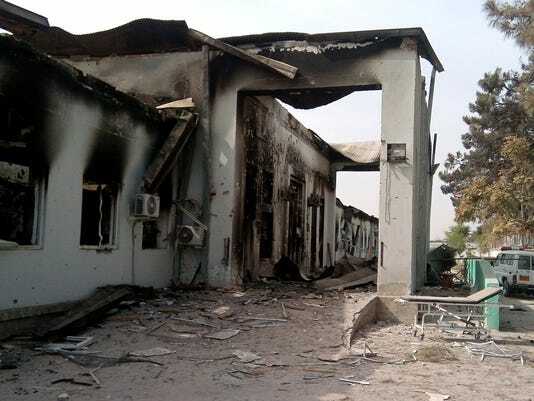 “They were absolutely trying to do the right thing,” General Joseph Votel, U.S. Central Command, said of the non-combat Special Forces who inadvertently razed the hospital instead of the nearby Taliban headquarters they meant to target. When Obama announced the end of the Afghan war in 2014, American forces remaining in the country were supposedly restricted to two “non-combat” missions: the NATO training initiative, Resolute Support, which advised the struggling Afghan forces in their continued battle with the Taliban; and Freedom’s Sentinel, a counter-terrorism effort that would exclusively target al Qaeda and ISIS. Both operations were headed by U.S. General John Campbell. 87 Americans have been killed or wounded in the past 18 months of these nebulously-designated initiatives, many under the command of Major Michael Hutchinson, Ground Forces Commander. Kunduz was captured by the Taliban on September 28, five days before the DWB hospital destruction. NYT reports this was the Taliban’s first regional capital acquisition in 14 years. On the 29th, Hutchinson commanded Special Forces including Green Berets to assist Afghan forces in repelling Taliban from the Kunduz airport: the same airport, apparently, that brought in supplies for the ill-fated DWB (M.S.F) hospital established there in 2011. The lines between Resolute Support and Freedom’s Sentinel appear to have muddied as many Afghan soldiers reportedly fled Kunduz and those who remained were completely dependent on the American reinforcements. The Americans were supposed to leave after the first 24 hours of combat, but instead of a 500-strong Afghan relief force, they met up with “a few Afghan police and army personnel,” who were adamant they would leave if the U.S. troops headed out. American forces appear to have therefore sustained assault for days without adequate classification of their mission as it pertained to Resolute Support (support Afghans against Taliban) or Freedom’s Sentinel (self-defense against al-Qaeda). Hutchinson had submitted a battle plan for the days of siege, “Kunduz Clearing Patrol,” using Resolute Support rules of engagement; it was approved as a Freedom’s Sentinel mission. NYT: [I]n the first four days of fighting in Kunduz, 13 airstrikes were conducted under Resolute Support and nine under Freedom’s Sentinel. Before conducting strikes, aircrews would sometimes radio to ask under which mission they were about to shoot. What does this murky mission have to do with the DWB hospital? The (shaky) “self-defense” justification for the arguably offensive warfare the Americans were conducting meant an airstrike on a building could be approved on the ground, rather than run up the chain of command to General Campbell in Kabul. The Afghan National Directorate of Security building, believed to be occupied by the Taliban (a faction even the most liberal use of the Special Forces’ objectives did not permit them to engage) is the target the AC-130 gunship believed it fired on when it actually annihilated the hospital, as we reported previously. Hutchinson radioed the gunship–circling in poor visibility, with at least one communication channel knocked out hours before in takeoff–to perform a “defensive scan,” which was justified if, as reported, the Afghan commandos (who the U.S. were supporting) were indeed about to storm the NDS building. NYT notes this description matches not the NDS building, but the now-leveled hospital. Major General William Hickman, the head investigator of the Kunduz incident, maintained in the military report that Hutchinson’s intel from the the Afghans was “an ambiguous physical description” that “appeared to match the M.S.F. trauma center.” NYT contends the description is, rather, exactly that of the hospital. NDS is “a trapezoidal compound with a south-­facing gate and two main rectangular buildings facing each other across a cramped courtyard,” per the NYT. Hutchinson received a reprimand and relief of Afghan command. NYT reports his new assignment is executive officer of his battalion. General Campbell has retired. A DWB/MSF employee reported Taliban boss Janat Gul and deputy Abdul Salam (“shadow governor” of Taliban in Kunduz) visited the hospital September 29; DWB confirmed the latter was onsite, denying he entered the health care facility. On July 1, 2015, a similar circumstance with a Taliban operative occurred at this hospital. Afghan forces wounded Abu Huzaifa, and believed he was taken to the DWB facility, which helped everyone regardless of affiliation until America wiped it off the map. The pursuing Afghan commandos–trained by U.S. forces through the NATO operation–entered the hospital violently, assaulting staff and firing their weapons. The hospital had to close off new admissions for five days to get back under control. Kunduz had fallen to the Taliban 5 days before the destruction on September 28. American Special Forces were in the Kunduz airfield reinforcing the situation, out of food and relaying intel that Afghan allies were about to assault a Taliban base at the National Directorate of Security (Afghanistan’s CIA equivalent)–1600 feet from the DWB hospital. The AC-130 crew took off to support the Kunduz ground forces over an hour ahead of schedule due to another emergency situation, which the New York Times reports abbreviated the mission brief. Just after takeoff, the satellite radio failed, preventing further data upload, including designation of the hospital building as a protected site. Enemy surface-to-air missiles threatened the American ship, and it had to alter its 2-mile loop necessary to aim the weaponry, including a “105-millimeter howitzer,” to take cover before lending support. NYT notes the diversion disrupted the targeting accuracy of the batteries. The gunship proceeded to their designate coordinates, and–seeing the “target” was an empty field–the crew used only their vision to decide what the actual bombardment site was. This came from an American Special Forces radio transmission. Due to the failed satellite radio, how the AC-130 picked up the transmission is unclear. At one point, the crew was told it would need to hit a second target after the strike it was about to commence, and “we will also be doing the same thing of softening the target for partner forces,” that is, Afghans. “I feel like let’s get on the same page for what target of opportunity means,” the navigator suggested. “When I’m hearing targets of opportunity like that, I’m thinking you’re going out, you find bad things and you shoot them,” a crew member responded. But after “several attempts” to clarify which building should be struck, the aircraft was directed to the hospital. At 2:08 AM local time–again, using the tried and true navigation technology of eyesight, clearance to commence slaughter was given. The DWB call log shows the latest outgoing call (along with desperate staff text messages) at 2:56 AM, pleading for the American ship to cease the bombardment. A surviving staff member received a text message from American headquarters in Kabul: “I’m sorry to hear that, I still do not know what happened” This was at 2:52 AM. But the American Special Forces report maintains the strike was called off at 2:38 AM. The reluctance to cease a full-blown assault appears to be due to nine men walking between the buildings of the hospital and representing a threat to American ground forces (who were not espied in the dark). The gunship assumed they were hostiles. Photo by AFP via Getty Images on Military Times page. 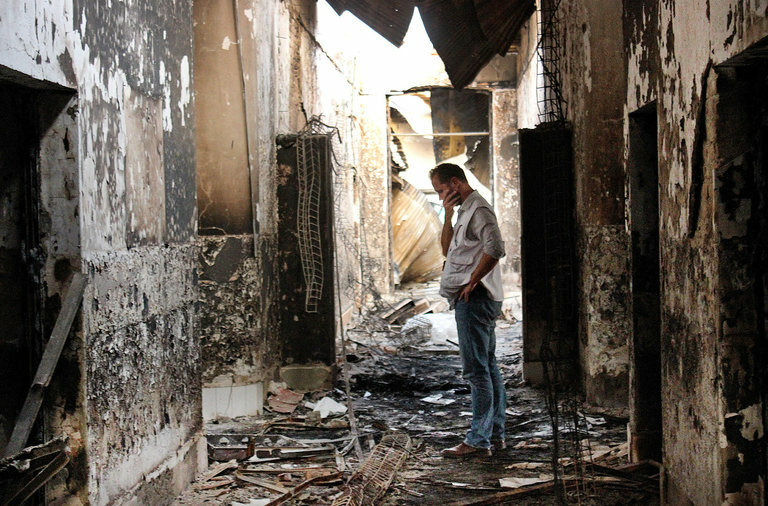 The DWB hospital on 10/13/15, ten days after the American shelling that killed 42. Consequences have been handed down for the destruction of a Doctors Without Borders hospital and the volunteers and patients within by the United States military in Kunduz, Afghanistan last October, a tragedy a top U.S. general blamed on “human errors, process errors and equipment failures,” the Military Times reported Friday. 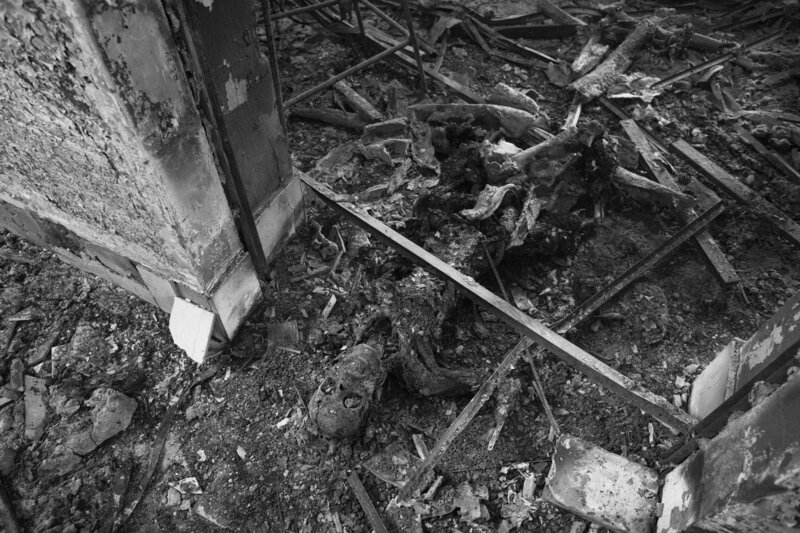 Afghan officials claim the blackened shell of the hospital has been claimed by the Taliban, in the aftermath of those DWB volunteers who were not killed in the American bombardment withdrawing from Kunduz. However, as MT notes, no evidence of Taliban occupation has been presented. This is ironic, because there was no evidence of enemy activity in or around the hospital when the American AC-130 gunship fired 211 shells in 29 minutes at that structure instead of the Taliban command center thought to be 450 yards away. President Obama and Secretary of State John Kerry are not expected to weigh in on what seems a slap on the wrist for the crew of an operation that ended 42 innocent lives. As of December 9, as the conservative news outlet Daily Caller notes, not a single country had yet supported DWB’s pleas for an independent investigation of the massacre. At that time, over half a million petitions were signed for the White House to investigate the attack. The White House Office of Public Engagement (read: descending to talk to the little people), under direction of Valerie Jarrett, refused to schedule an audience with DWB, according to the latter group’s U.S. Executive Director Jason Cone. When the White House would not acknowledge the petitions for investigation, DWB staged a public protest in Lafayette Square, across the street from the presidential mansion. President Obama did make a personal phone call to Dr. Joanne Liu, president of MSF International, the better-known acronym for Doctors Without Borders. Kerry did not mention whether this bombardment counted as Assad crossing the “red line” Obama proclaimed years ago, before Assad resumed using chemical weapons against civilians. At least 50 people were killed, including one of the last known pediatricians in Aleppo, Syria, according to Cone. 148 Syrians have died in hostilities since Saturday. This has led international spectators to worry the “cease-fire” of the Syrian civil war is crumbling. MSF’s head of mission for Syria, Muskilda Zancada, said the organization condemned the “outrageous targeting of yet another medical facility” in the country. “This devastating attack has destroyed a vital hospital in Aleppo, and the main referral center for pediatric care in the area. Where is the outrage among those with the power and obligation to stop this carnage?” she said in a statement. A U.S. military official told CNN that U.S. forces were not operating in the area of the hospital, and their closest strike had been 20 kilometers (12.4 miles) to the north. According to the United Nations, over 250,000 have died so far in the 5-year Syrian civil war. Thanks to Military Times and CNN for today’s update.